It may have taken less than three minutes to get rid of his latest opponent but getting to the ring was a much tougher task for Gavin McDonnell on Saturday night. 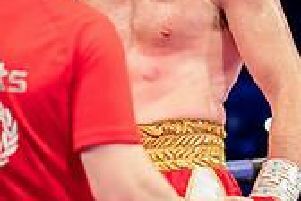 Opponent withdrawals, paperwork wrangling and transport issues blighted the buildup to the latest outing for the Doncaster fighter. But he took any frustration he harboured out on clueless opponent Jozsef Ajtai and got the fight over and done with inside the first round at Manchester Arena on the undercard of the cracker between Anthony Crolla and Ricky Burns. Ajtai had been drafted in at late notice after original opponent Jay Carney was forced out on medical grounds as late as last Wednesday, sparking a late scramble for a replacement. “It’s hard enough getting an opponent at the lower weights when you’ve got weeks to play with, never mind days,” McDonnell’s manager Stefy Bull told The Star. “But we sorted this kid. Only then, he didn’t get on the plane. “Eventually he arrived, at six o’clock the night before the fight. “Gavin didn’t get his medical stuff signed off until 3.40 the day before because the paperwork hadn’t been processed properly. “It was a nightmare build-up. We were just focused on getting Gav in there and getting the job done. “He’s spent the last ten weeks of his life training for that night so you don’t want to chuck it all away. “The fight itself was a bit of a farce. The other kid just ran from the start and you could see what was going to happen as soon as he got hit. “And sure enough, when Gav caught him properly he was throwing himself down. McDonnell is keen to be out again before the end of the year as he continues to push back towards world title level. He was beaten by the superb Rey Vargas on points for the WBC super bantamweight title in February and is determined to return to the world title picture as soon as possible. Bull said: “We want something big for him but we want to be fighting again before Christmas to keep him busy. “Matchroom are talking about a show in Sheffield in the New Year and Gav would be a big part of that in a big fight.